One of the yearly food events I always look forward to is the Chile Fest at Z’Tejas Southwestern Grill. That is when, for a couple weeks in the fall, The Gateway is enveloped by the heavenly fragrance of Hatch green chiles from New Mexico roasting outside in the crisp, cool air. Better yet, those fresh-roasted chiles are then incorporated into numerous Z’Tejas specialty menu items. For a chile-head like me, that’s heaven. Of course, there are chiles featured on the Z’Tejas menu year-round, which makes anytime a good time to visit for a chile fix. And although Z’Tejas was born in Austin, Texas, and there are now 11 locations in the western United States, each Z’Tejas is somewhat unique—and the chefs and kitchen crews have a lot of room for improvisation. These aren’t cookie-cutter eateries. A few months ago, when longtime Z’Tejas Executive Chef Todd Gardiner departed to open up Taqueria 27, Sam Lubing took over as head chef at The Gateway’s Z’Tejas location. He moved over from The Red Iguana, where they know a thing or two about Southwestern flavors. Originally, he’d come to Utah to follow his dream of being a professional skier, before skiing injuries redirected his career path. I think he’s on the right path, because the food at Z’Tejas is spot-on. Unlike a lot of franchise food, dishes at Z’Tejas are mostly made from scratch. There aren’t a lot of canned, frozen or prepackaged foods in the kitchen’s pantry. So, for example, when you start out with chips and salsa, both are made from the ground up. I like to begin a meal with the Tejas trio ($9.95): freshly fried yellow and blue corn chips served with a triad of sauces. There is fresh, “hand-hacked” guacamole, which is made from scratch every few hours; a rich, smoky-flavored red salsa picante, redolent of chipotle and arbol chile peppers; and finally, an irresistible chile con queso, the deliciously gooey cheesy goodness spiked with peppers and a fiery decorative “Z” made from chile sauce slashing across the sea of queso. The chile con queso comes to the table in a cast-iron skillet, as does the complimentary cornbread served with every meal. Believe your server when they tell you those pans are hot. 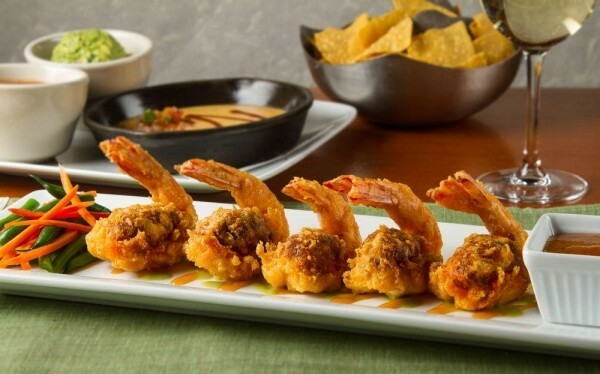 Another excellent Z’Tejas starter is the grilled shrimp & guacamole tostada bites. Crispy tostada rounds—about the size of a half-dollar (remember those? )—are topped with guacamole, a dollop of chipotle and crisp but tender cilantro-pesto-marinated grilled shrimp ($10.50). The dish is attractively garnished with smashed corn-chip slivers, adding a little extra crispness to the affair. Before we leave the appetizer section of the menu, I must give a big shout-out to Z’Tejas’ blackened-catfish tacos ($10.50). Dang, these babies are dee-lish! Large chunks of catfish are blackened and rolled into flour tortillas, “wrap-like,” along with Southwestern-spiced slaw, zippy jalapeño mayonnaise, avocado and crisp tortilla strips to give the tacos a nice crunch and texture. The tacos are served with a fragrant Asian-style dipping sauce alongside—a nice surprise. For those hankering for a more traditional taco, there are “street tacos” ($10.95) on the menu: seared beef tenderloin topped with cotija cheese, avocado, cucumber and chipotle cream sauce, and served with luscious avocado salsa verde. Salad lovers will appreciate the enticing selection of entree salads, running the gamut from Parmesan- and pecan-crusted chicken salad ($11.50) or grilled-salmon salad with sun-dried-tomato vinaigrette ($13.50), to a spicy red chile & mango steak salad made with seared beef tenderloin and topped with blue cheese and spicy walnuts ($12.25). By the way, Z’Tejas offers lots of specials throughout the week, including a happy hour with bargain-priced appetizers Monday through Friday from 4 to 7 p.m. You could score the aforementioned blackened-catfish tacos, for example, for $5, the Tejas trio for $6 and the grilled shrimp & guacamole tostada bites for $7, just to a name a few of the discounted dishes. In addition, there’s a very economical “kidz” menu, with all entrees just $5.95, including a beverage. My son loved his grown-up-size burger topped with Monterey Jack cheese and served with a hefty helping of steak fries. On Monday nights, kids get a free entree choice from the kidz menu with the purchase of an adult one. If I had to recommend just one can’t-miss dish at Z’Tejas—although there are many—I’d have to go with the pepita-crusted chicken ($12.25). It’s a “stacked” dish: delectable layers of sweet-potato hash, artichokes, spinach, mushrooms and cilantro-pesto chicken breast crusted with crushed pepitas (pumpkin seeds). It’s all bathed in an outrageously good roasted-poblano-chile sauce—an outstanding dish. A bit more mainstream is the pork-verde burrito ($10.50), which is slow-roasted pork with green Anaheim chiles, Jack and cheddar cheeses, rolled up in a big flour tortilla and topped with green-chile tomatillo sauce. I like the nonstandard nopalitos (prickly pear cactus) salad and the borracho (drunken) beans on the side, where normally you’d expect Mexican rice and refried beans. And I don’t see a lot of duck on Southwestern restaurant menus, but another killer Z’Tejas dish is the duck relleno ($14.95): tender braised duck, shredded and stuffed into a poblano chile with Jack cheese and roasted corn, served with rich guajillo-chile cream sauce and cotija-dusted pinto beans on the side. I should note, too, that libations at Z’Tejas are as varied as the cuisine. There’s a sprawling selection of adult beverages, from ice-cold beer and wine to margaritas and a wide range of specialty cocktails, not to mention an award-winning tequila assortment. Dropping in for a margarita on the Z’Tejas patio for Cinco de Mayo would be an excellent strategy.